My four year old is preparing for VPK in the fall so we have been trying to practice basic skills like letter recognition, counting, addition....and the biggest one of all following directions and listening. All of which will help her to be successful in the primary classroom. So today we learned about the letter W. We started our day off by making some Watermelon waffles, which were the yummiest! Make your favorite waffle batter and divide into two bowls. Add red food coloring to one and green to another. Mix well, using a round waffle maker add your red batter slowly to the center not filling too full, then slowly add your green batter around the outer edge. Sprinkle a few chocolate chips into the center and close the waffle maker. While your little one is waiting have them practice their handwriting skills by writing their W's, Visit my Teachers Pay Teachers store for some fun printables you can use. Another game you can try while waiting for those waffles is to ask your little one to name as many W words as they can...it's pretty fun to see how many they can come up with. If they give you a word that begins with a different letter, ask them them to repeat the W sound to you and repeat to them a few of the words they have given previously, whale, wish, water, and then ask "does your word have the same beginning sound as those?" It's important to not squash their confidence but equally as important to direct them into the appropriate answer when they are incorrect. When our waffles were done I cut out a large W out of construction paper. We reviewed the W words that she came up with and talked about the sound a W makes. I had her practice her cutting skills by using her scissors to cut squares from strips of tissue paper. Cutting can some times be very scary for mamas of girls...we are so afraid for them to cut their clothes or even worse their hair! But it is a necessary skill that kids need to be comfortable with before heading off to Kindergarten, I can't tell you how many first graders I have had year after year that have no idea how to cut and use a glue stick because they never used those skills at home. Those skills are important both in and out of the classroom. With this activity we talked about using a glue stick appropriately and keeping within boundaries. I showed Kaitlyn where the green tissue paper should stop and let her go from there. I helped her towards the end to fill up the empty spots but for the most part she was able to do this one on her own. 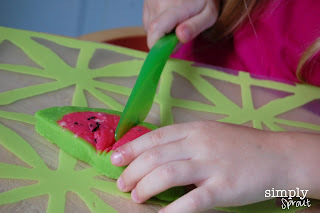 At the very end she crumpled up some black tissue paper and made seeds to add to her watermelon W.
We have had a lot of fun with playdough at our house recently, it is so easy to whip up a batch and is a lot of fun for little hands. Make one batch red and one batch green, let cool on a floured cutting board. After its cooled add a little more flour as you blend the playdough together. Keep adding flour till its no longer sticky and is moldable. We used black long grain wild rice for seeds for our playdough, just sprinkle a few on top of the red playdough and have your little one blend them in and make a long roll of the red playdough. 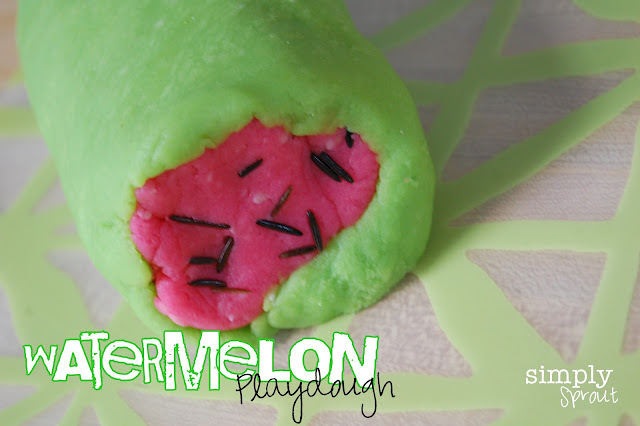 ave your little one use a rolling pin to roll out the green playdough. Place the red log in the center of the green and wrap it around by rolling it up. 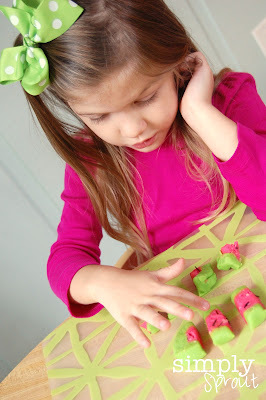 Another great way to use these cute little watermelon slices is for counting, practice that 1 to 1 correspondence by having your little one touch each piece as they count them. We also took it a step further and started talking about addition. 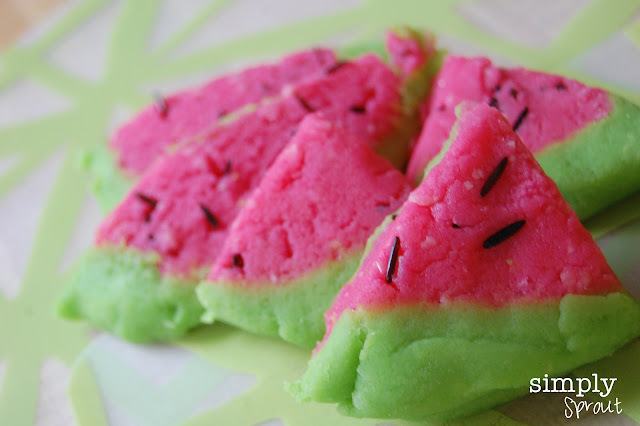 If I have 2 pieces of watermelon and you have 3 . How many do we have all together? You will be surprised what your little ones can do when asked the right questions. Another great activity is to take two slices of the watermelon and compare the number of seeds. 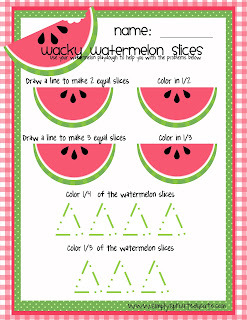 fractions to your little ones. For your older kids grab the freebie on the right. 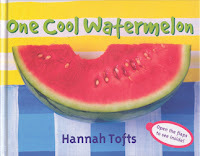 Kids can count their way to some watermelon math fun with these delicious watermelon books. 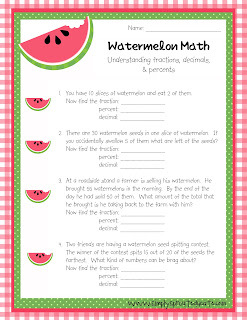 One Cool Watermelon is an introduction to math through familiar fruits and vegetables. This book has a vibrant, interactive layout that allows little ones to open flaps and view the inside of each fruit or vegetable. What a fun way to introduce fractions to young learners and compare parts to the whole. 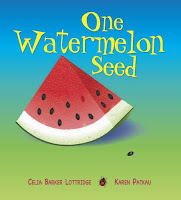 One Watermelon seed offers colorful pages and follows a seed as its planted. It exposes little ones to counting by tens, and learning about larger numbers. 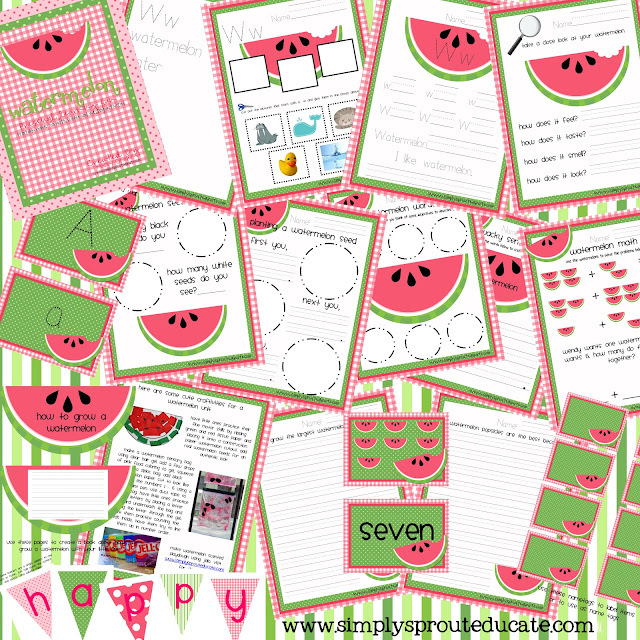 If you are looking for some watermelon activities for your little ones to keep them learning check out my watermelon resource pack for Primary learners. ( Pre-K - First grade) There are a lot of activities included, handwriting skills, grammar, letter sounds, beginning writing concepts, flash cards and basic math skills just to name a few. Stop by my Teachers Pay Teachers store to check it out! For our older friends Amanda has designed an activity pack that incorporates hands on math, science and writing skills. 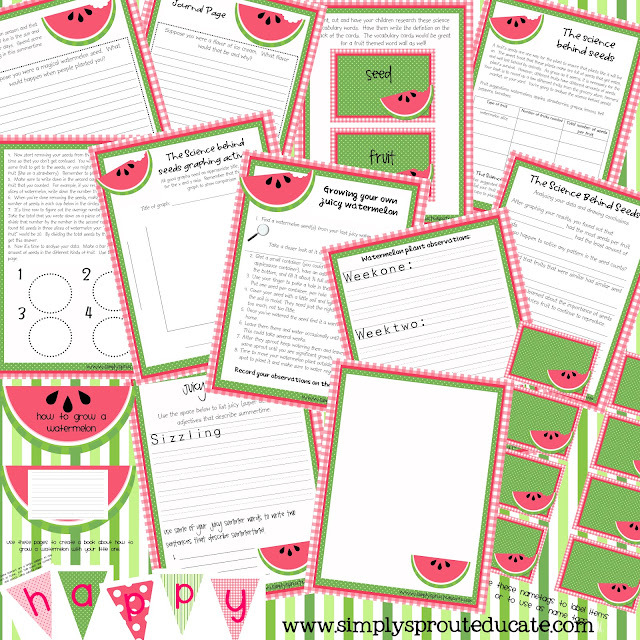 Check out her Intermediate (grades 3 - 6) activity pack at her Teachers Pay Teachers Store. For our local friends be sure to checkout the Watermelon Festival in Monticello this weekend June 16, 2012. What a great way to tie learning into your local community. Have your little one count how many W's they see on signs and buildings while they are there. What a WONDERFUL post!!!! Thank you for offering a multitude of activities! The playdough activity looked fun to make and the packets are amazing! Thanks! Thanks Christina! We hope that you and your family have some fun with these educational ideas! Nothing says summer like some watermelon!